We’d love your help. Let us know what’s wrong with this preview of PBSUCCESS by Mario Overall. 'In January 1954, at the peak of the so-called -Cold War-, the U.S. Government set to overthrow the Guatemalan President Jacobo Arbenz, who had been deemed a Communist and a dangerous influence in Central America. 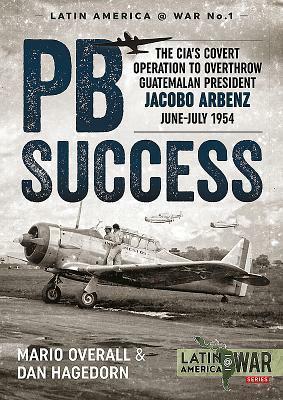 Thus, the Central Intelligence Agency was ordered to launch a clandestine paramilitary operation, code-named -Project PBSuccess-, for setting a precedent in a re 'In January 1954, at the peak of the so-called -Cold War-, the U.S. Government set to overthrow the Guatemalan President Jacobo Arbenz, who had been deemed a Communist and a dangerous influence in Central America. Thus, the Central Intelligence Agency was ordered to launch a clandestine paramilitary operation, code-named -Project PBSuccess-, for setting a precedent in a region that was considered the U.S. backyard. Six months later, Arbenz was out and a new -ruling junta-, more amiable to U.S. interests, had replaced him. In the process, the Agency not only had established the principles and tactics for all its future covert operations, but also had shaped the U.S. foreign policy for years to come. To ask other readers questions about PBSUCCESS, please sign up.